So, what seems like forever ago (but was probably 2011), I started following the Food In Jars blog. 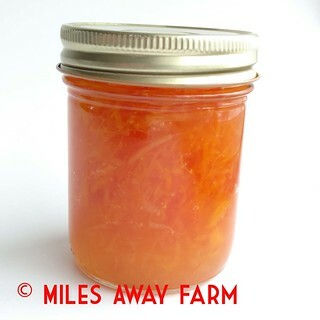 A nationwide resurgence of interest in home canning and preserving was happening, and Marisa McClellan was one of the main movers and shakers behind the renewed interest in this almost lost art. Her information was safe, accurate, and inspiring. Today, the canning inspiration on her blog has died down, as Marisa has moved on to three books and a suite of speaking engagements throughout the year. But this year, she has resurrected a great blogging tradition, the monthly canning challenge. Each month, a particular produce or technique is featured, and participants post their results with this ingredient. I’ve often used the results of past challenges as inspiration for my own recipes. I look to see what everyone else has done with tomato jam before coming up with my own recipe. So, this year, I decided to participate in the Food In Jars Mastery challenge. January was Marmalade. I actually DID make marmalade (my go-to marmalade recipe that I sell at market), but didn’t get it written up for the January 25th deadline. The technique for February, which, lets face it, is a month bereft of fresh produce, was salt preserving. Lots of suggestions were put forth, including preserved lemons and sauerkraut. 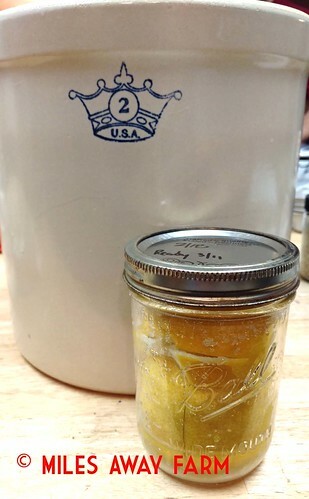 I’ve read about preserved lemons – anyone who considers themselves a foodie probably has, but I had never gotten around to making them. So this was the month. Tons of ideas on how to use them here. My heritage is half German, so you’d think I’d have a great love of sauerkraut. But I don’t. 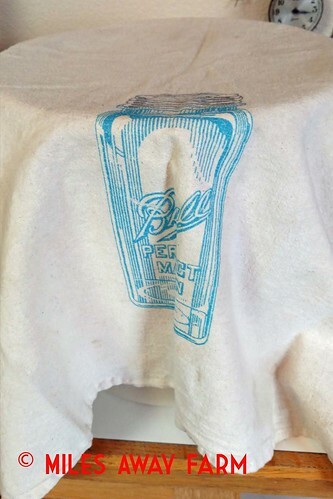 In elementary school in Twin Falls Idaho, they used to serve it in the cafeteria. Giant #10 cans of the stuff. You could smell it all over the school on the mornings it was to be served at lunch, and to me, it smelled just like vomit. So I literally never let a fork full of sauerkraut pass my lips until I was in my late 20’s. I’ve since made my own, using Sandor Katz technique. But I’ll be honest, its never something I get super excited about. That said, I happened to still have 2 good sized cabbages harvested from the garden back in November, and a new found love of kombucha, another fermented product I used to shun, so I figured this was the year to try some sauerkraut again. Besides, I have this fabulous #2 crock I bought new about 10 years ago to make fermented pickles in, and I haven’t used it in ages! So here are my two salt preserved products, for the February Food In Jars Mastery Challenge. The process was simple. I made sure to buy organic lemons, I washed them well, and then I cut them into 8ths, leaving the bottom intact. I sprinkled about a tablespoon of sea salt on the bottom of a wide mouth pint jar, sprinkled all cut sides of lemon with salt, and stuffed the lemons into the jar. Squish to release juice and shake every few hours until more juice is released. Because the liquid only reached about half way up the jar after 24 hours or so, I topped off with some fresh meyer lemon juice. Because the fruit wanted to float, I used these handy glass sauer stones on the top of the jars to hold the fruit under the liquid. The fit perfectly into a wide mouth jar. After sitting in the fridge for 3 weeks or so, they will be ready. Thoughts: Not sure why the bottom of the fruit is traditionally left intact, as I don’t think they get served that way. You can pack a lot more fruit into a jar if the fruit is segmented rather than left intact. So if it turns out I like these babies, that’s what I’ll do next time. Hank Shaw, over at Hunter, Angler, Gardener, Cook suggests water bath canning them for 10 minutes to ensure sterility. Not a bad idea, but I was concerned that the heat would affect the texture of the fruit too much. He also gives some additional methods from other cultural traditions (Russian, India), including herb and spice additions. Lots of ideas for further exploration later. Again, super simple. Sauerkraut is the gateway vegetable to all things fermented. Its near impossible to mess up. In fact, fermenting vegetables in salt in general is near impossible to mess up. Katz, who is to fermented vegetables what Marisa is to canning, says that “according to the USDA, there has never been a documented case of food poisoning from fermenting vegetables”. 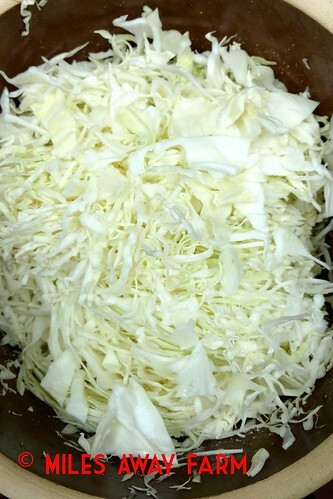 At its simplest, sauerkraut its just cabbage and salt. You slice the cabbage thin, as if you were making coleslaw, sprinkle it with salt (between 1 1/2 and 2 tsp per pound of shredded cabbage), massage it around with clean hands, pack it into a jar or crock, let it release its juices, pack it down so its juices cover the surface and the cabbage is submerged, cover with something that will breathe but keep dirt and bugs out, and let sit for a few days to a few months, depending on how cool it is and how tangy you like it. For those of you who want to be more scientific (ahem…me) and go by weight or % brine rather than just tablespoons, recommendations range from 1 to 2% salt. Three tbsp table salt is 39 grams. 5 lbs cabbage is 2268 g. So 3 tbsp to 5 lbs is about 1.7% salt. Too much salt, and the fermentation will not occur. Too little and you run the risk that the bad guys will get a foot hold before the good guys get a chance to make the produce acidic enough to keep them out. Salt also helps keep your vegetables crunchy, which is often desirable. That full crock above? THIS is what it looked like after the cabbage had wilted, released its juice, and been tamped down. Volume reduced by more than half. 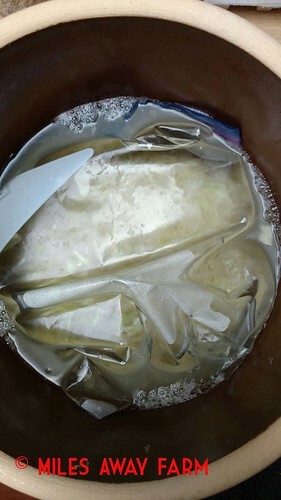 Using a large zip top bag of water is a great way to weigh down your ferment if you don’t have a plate or something else that fits nicely into your container. Thoughts: Having a mandolin is REALLY helpful for making sauerkraut. I like this one from Oxo. 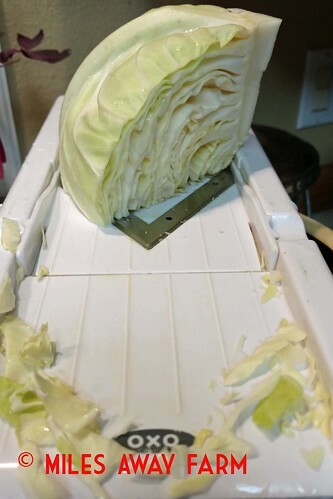 I did not slice up the cabbage cores (though you can). 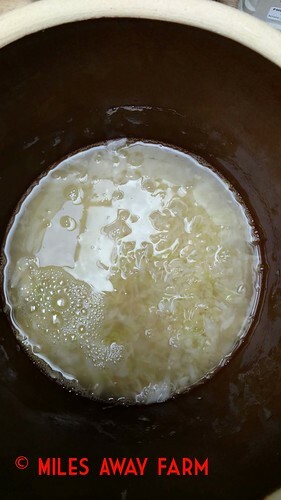 Because my cabbage had been sitting for a couple of months, and because my crock has a large surface area, I ended up tamping down my cabbage with a wooden dowel to get it to release enough juice, (after it had been sitting for 12 hours or so, weighted, and still wasn’t covered in its own liquid). I could have just added a bit of additional water too. But I know that traditional kraut is often “stomped” down, and so I just went with that method. Weighing your cabbage down, so it stays submerged, using a zip top bag full of water, is a great trick, if you don’t happen to have crock weights. You can also just pack your kraut into mason jars and use a fermentation lid/lock. The lactobacilli bacteria will pretty quickly do their thing, changing the pH of your cabbage to a lower safer acidic pH (people make fermented vegetables using a bit of purple cabbage, which is pH sensitive, so that they can SEE the pH change – how cool is that). 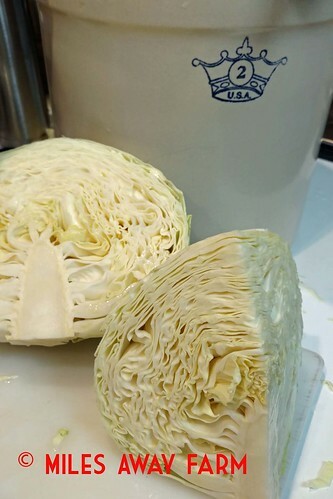 Temperature and salt content affect how fast your cabbage will ferment, so taste every couple of days, and toss if it starts to smell rotted rather than just sour. A bit of mold on the surface is not unusual, and does not necessarily mean your ferment has gone bad. Often, its OK to just scrape it off. One of the other ideas for the salt preservation challenge was spice mixes. I’ve made this Rosemary Sage Herb rub before, but unfortunately it kind of got lost in the cupboard. Evidently, its commonly used in Northern Italian cooking, and I’ve resolved to give it another look and make better use of it when the sage is going strong again this summer. Weirdly, I never grew up using Lemon Pepper, though I know it is a kitchen staple for a lot of folks. It recently occurred to me that it can’t be that hard to make. So, the next time I have three or four lemons to zest, I’ll be trying out this recipe, but drying it on the lowest setting (95 degrees) in my food dehydrator, rather than in the oven. I suspect that the volatile lemon oils will disappear if this is dried at too high a heat. I really like the idea of the added coriander and allspice in this mix. Kraut, covered (with this wicked cook flour sack towel that I HAD to have) and fermenting away. So, there you have it. Salt preservation for February. (Salted egg yolks I’ll save for next year). What’s February inspiring YOU to play with in your kitchen? Miles Away Farm Blog © 2017, where it seems like we’re miles away from spring, and today its dumping rain, but we KNOW its just around the corner! Your never ending ambition never ceases to amaze me! I always have wanted to make preserved lemons, and particularly since I saw a recipe for lamb using preserved lemons. Like you until now, I have just never gotten around to making them either. Please keep us updated as to how they turn out!